Are you considering a VR training program for your workforce? 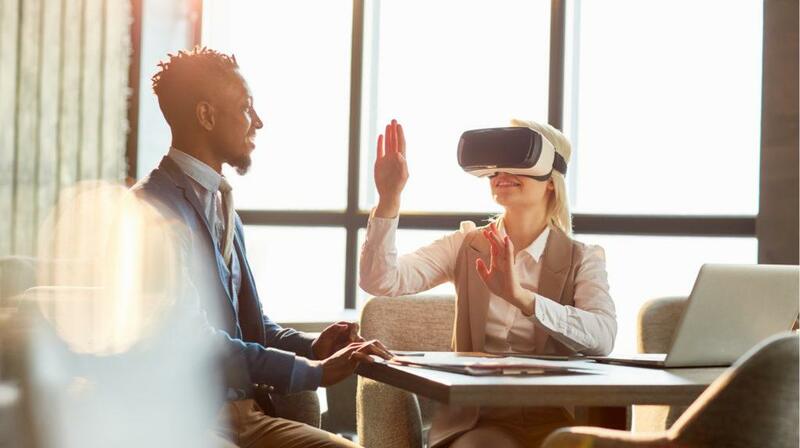 In this article, I share 7 key elements of VR and reveal how it can be used to improve the employee engagement and retention seen at your company. Today, when it comes to employee satisfaction in the workplace, employees consider professional development as important as the job they are doing. It’s important for companies to invest in their training programs in ways that distinguish them from the rest, and let staff members know they are valued. VR training is an effective way to do this. This learning approach brings many advantages that help to boost employee engagement and retention, which are some of the hardest goals to achieve during training. As the hardware gets more affordable, companies are taking note and beginning to successfully incorporate VR into their training programs. Employees see companies that adopt cutting edge technology as those that are invested in their future. Read on to learn more about how VR can improve your training program and the benefits that can be gained by your employees. VR brings the distinct advantage of providing learners a hands-on, immersive experience in a repeatable and scalable training program. Live demonstrations incur facilitator costs with each session, and there is no way to guarantee the learners of the previous session are getting the same quality of instruction as the next. With VR, you can uniformly train your entire team with one Virtual Reality course an infinite amount of times at no additional cost. You can be sure that all your employees are taught a particular procedure the way you intend while testing the mastery of certain skills with assessments throughout the training, thus improving employee engagement and retention. VR is also free from traditional live training costs that come in the form of physical training equipment and instructional supervisors. Some training content can only be taught using a hands-on approach, particularly when the learner will be implementing the new information in a highly stressful environment. Accessing a learner’s proficiency with this type of information during training is a challenge if it is taught in a classroom or via other theory-based methods. How well a learner performs these tasks in a theoretical setting is not an accurate predictor of how well the learner will behave in an actual situation where there is a tremendous amount of pressure and chaos. VR impacts employee engagement and retention here as well, as it recreates nearly an identical environment to which learners will be performing tasks in real life. This allows them to practice and learn from their mistakes without causing any real-world harm. In these virtual environments, learners must take all variables into consideration in order to complete the needed action, just as they would in reality. STRIVR, A VR training company, has created a mine rescue training program in which the participant must make judgments based on ever-changing variables, like how much oxygen is available, in order to make the best decision possible based on the present situation. Learners successfully demonstrate their ability to perform these vital skills before ever being put into the field in harm's way. Even live training would fall short at producing all of the factors one must take into account during an emergency, and the dangers of even attempting to replicate it would be significant. The aviation field was one of the first industries to adopt VR training, using Virtual Reality to prepare their pilots for emergency procedures that would be too dangerous and costly to mimic in real life. While a mistake in the VR training could be a great learning moment for pilots, a mistake made in the real world could cost them their lives. Learners tend to be easily distracted. VR has the ability to cut out any possible diversion and keep employee engagement high during your training. While your learner is wearing the VR headset, you are in complete control of what they pay attention to. Learners can’t glance at their phone every few minutes or daydream as they can in traditional training, in turn also increasing employee retention due to the heightened focus. VR technology can stimulate multiple senses at the same time, increasing the level of realism for the user. Your brain comprehends what you are seeing and hearing very closely to how you would perceive it in the real world. In an article published by Education Psychology Review, the authors explore how memory is anchored and strengthened with multi-sensory input. VR haptics add additional layers of sensory feedback, richening the experience. Through the use of controllers and wearable technology (like gloves, shoes, vests, or bodysuits), users get to feel aspects of the virtual environment through their sense of touch. Learners report their VR experience as feeling like something that actually happened to them, which concretes it in their memory and positively impacts the overall employee retention. With low employee engagement and retention, an employee may not feel adequately prepared in their job role. This will often lead to an increase in frustration, and they will ultimately be more likely to quit. Employee turnover is one of the most costly factors for a company, and many cite an inadequate level of training as their reason for leaving. By allowing employees the ability to do the job in the virtual world, they will feel prepared to tackle their role in the real world. Walmart has begun equipping each of its stores with VR headsets and an evolving Virtual Reality training library. Current topics range from Black Friday scenarios to a Pickup Tower simulation. Walmart US Academies Senior Director Andy Trainor has enjoyed the increase in employee confidence and retention that VR training has created, as well as the increase in training test scores. Interestingly, it has been shown that when associates who have not participated in VR training observe associates who have, they show improvement in customer relations skills. Companies across many industries have also turned to VR thanks to the proven decrease in training time needed to produce employees that are ready for duty. United Rentals, an equipment rental company, experienced a reduction in the time it takes to train their employees by half. With this learning approach, you have the ability to offer more employee engagement in a shorter period of time while also seeing improved employee retention with reduced training durations. VR is more memorable than live training, which is another key reason it enhances employee retention. According to STRIVR, a company that creates VR learning experiences, learners who use VR retain 75% of what they are taught while methods like presentations have only a 10% retention rate. When it comes to using VR training, there are many methods available that will allow you to boost your employee engagement and retention. VR training is quickly becoming one of the most powerful learning technologies and should be considered a major advantage for your company’s corporate learning strategy. If your company is ready to incorporate innovation that will enhance your employee engagement and retention, consider a VR training approach.